This set of five volumes, four volumes edited by Edward D. Palik and a volume by Gorachand Ghosh, is a unique resource for any science and technology library. It provides materials researchers and optical device designers with reference facts in a context not available anywhere else. The singular functionality of the set derives from the unique format for the three core volumes that comprise the Handbook of Optical Constants of Solids. The Handbook satisfies several essential needs: first, it affords the most comprehensive database of the refractive index and extinction (or loss) coefficient of technically important and scientifically interesting dielectrics. This data has been critically selected and evaluated by authorities on each material. Second, the dielectric constant database is supplemented by tutorial chapters covering the basics of dielectric theory and reviews of experimental techniques for each wavelength region and material characteristic. As an additional resource, two of the tutorial chapters summarize the relevant characteristics of each of the materials in the database. The data in the core volumes have been collected and analyzed over a period of twelve years, with the most recent completed in 1997. The volumes systematically define the dielectric properties of 143 of the most engaging materials, including metals, semiconductors, and insulators. Together, the three Palik books contain nearly 3,000 pages, with about 2/3 devoted to the dielectric constant data. The tutorial chapters in the remaining 1/3 of the pages contain a wealth of information, including some dielectric data. 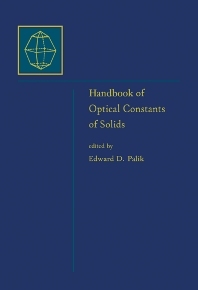 Hence, the separate volume, Index to Handbook of Optical Constants of Solids, which is included as part of the set, substantially enhances the utility of the Handbook and in essence, joins all the Palik volumes into one unit. It isthen of great importance to users of the set. A final volume rounds out the set. The Handbook of Thermo-Optic Coefficients of Optical Materials with Applications collects refractive index measurements and their temperature dependence for a large number of crystals and glasses. Mathematical models represent these data, and in turn are used in the design of nonlinear optical devices. Industrial libraries and research groups in the industry dealing with optics and optical devices including lasers, fiber optic communications, applications to materials characterization, thin film processes, vacuum techniques,and electronic devices and principles, as well as spectroscopy. Libraries at most research and academic institutions where there is activity in optics and optics-related fields including applications in materials, condensed matter physics, and electronics. VOLUME FIVE: Preface. Introduction. Refractive Index: Introduction. Measurement. Dispersion Relations for Refractive Index. Derivation of the Sellmeier Coefficients. Sellmeier Coefficients. Comparison of RefractiveIndexes. References. Thermo-Optic Coefficients: Definition. Measurement. Dispersion Relations. Derivation of the Sellmeier Coefficients: Nonlinear Crystals. Other Oxide and Laser Crystals. Halide Crystals/Glasses. Semiconductors. Optical Fiber/Optical Glasses. References. Applications: Nonlinear Optical Laser Devices: Noncritically Phase-Matched Second Harmonic Generations. Noncritical Optical Parametric Oscillators. Sum Frequency Generation. Optical Fiber Communication Systems: Chromatic Dispersion and Zero-Dispersion Wavelength. Thermo-Optic Switch. Optical Fiber Temperature Sensor. Thermo-Optic Modulators. References. Future Technology.